Savour a taste of the edible alphabet, from A to Z. Throughout history, visual and performance artists have rendered their visions within the whimsical medium of food. 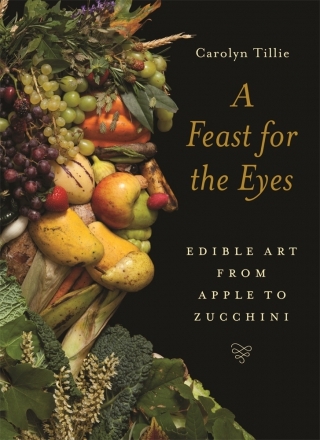 In Carolyn Tillie’s deeply satisfying A Feast for the Eyes, you’ll embark on a delicious adventure that redefines the art world. Explore the surprising artistry of apple-head dolls, butter sculptures, coffee paintings and a grand cathedral carved entirely from salt. Learn about the ancient role of food creations in ritual and global folk art. Experience the modern magnificence of electrified vegetable sculptures and ethereal molecular gastronomy. Discover why Salvador Dalí had an obsession with lobsters, and why there is a giant palace in the American Midwest made entirely of corn. Whether you’re a food lover or an art aficionado, this book serves up an aesthetic banquet that will delight your senses – and nourish mind, body and soul. Carolyn Tillie is a freelance writer and award-winning artist, and the author of Oyster: A Global History (Reaktion, 2017). She lives in the Californian coastal town of Montara.